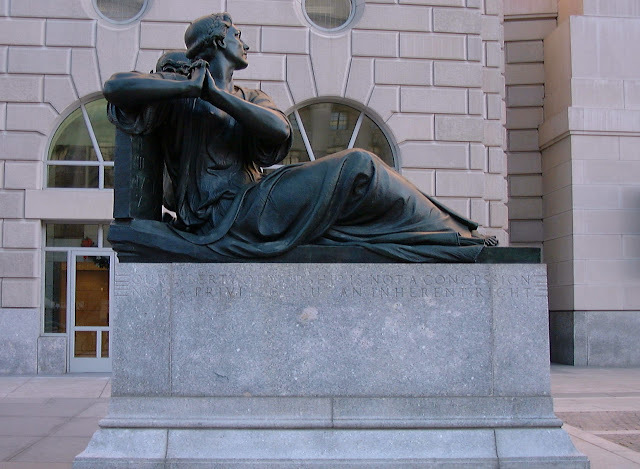 Part of the Oscar Straus Memorial in Washington, D.C. honoring the right to worship. Our country was founded on the belief that we have the freedom to disagree with one another. That simple edict is not present in most civilized societies to this day. 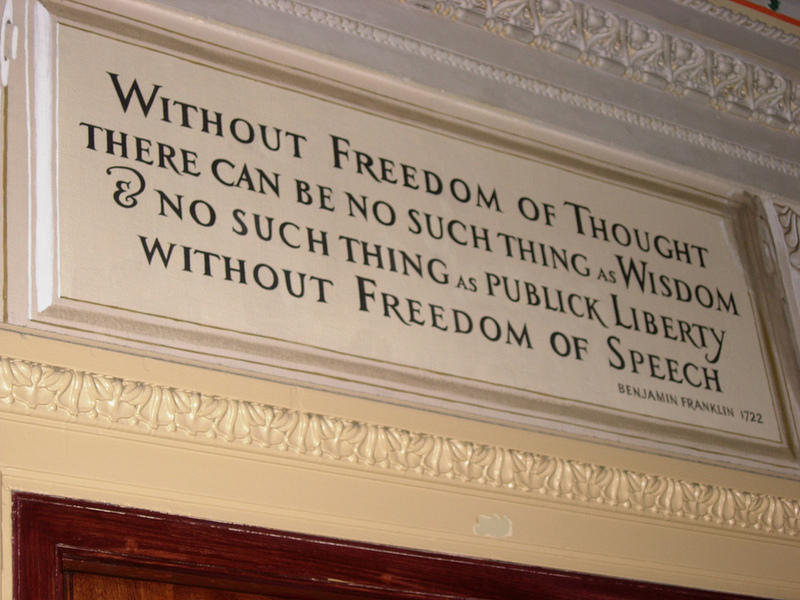 Many tend to assume free speech exists in Europe, Canada, etc, but that simply isn't true. In most other countries, if you say the wrong thing, say about Islam, or about marriage, or other contentious issues, you face the possibility of being fined tens of thousands of dollars, or being charged with a crime. I'll be brief. We're losing a vital freedom, a freedom that is dissolving across the face of the planet. That freedom is the freedom to practice religious faith in the public arena. We're got to take a stand now, today, before it's too late. The last standing nations that still hold a certain amount of religious liberty are the United States and the United Kingdom. But the United Kingdom is cracking down, just like France, and most other European nations. Canada is also cracking down on religious liberty, and free speech itself. Hate speech laws are being enacted. Who decides what is hate speech? Well, hate speech may quickly become the core tenants of the Christian faith. Or maybe in the future, the core tenants of any philosophy or ideology that disagrees with those in power? This process can be seen in accelerated form on college campuses. This isn't simply a Christian issue. It's an issue of freedom of thought and word. That freedom is cherished. But social justice warriors don't mind knocking over the core pillars of our society as long as they can push forward their agenda of forced equality on all levels. It's an authoritarian push, not really about LGBT rights, but at it's core about pushing a radical secular agenda based on transforming America into a European style Marxist utopia. It's a dangerous situation. Thankfully there are organizations like Liberty Counsel, Alliance Defending Freedom, Liberty Institute, Family Research Institute, and other groups willing to take a stand. Thankfully we have the Media Research Institute to call out media bias. Thankfully we also have some news sites willing to stand with us, like the Daily Signal, Conservative Review, and Life Site News. Notice how the biggest names are missing? The mainstream media in our country is radically secular, and consistently attack religious liberty as "bigotry" and "discrimination." We have many supporters in radio as well, like the Mark Levin Show, The Ben Shapiro Show, and Louder with Steven Crowder. Thankfully also, recently a movie came out called God's Not Dead 2. This movie attempts to shine a light on the issue of religious liberty. We need to raise our voices, and join the movement for religious freedom. Those are just a few. There are two lists I'm aware of, a list of eighty businesses and another including over 120 businesses that have raised their voice against North Carolina, Georgia, Mississippi, South Dakota, and others. I was shocked when I discovered the list of businesses making war on religious liberty. I had no idea so many massive businesses were willing to make war on Christianity practiced in the public square. It's truly disturbing. Consider becoming a faith driven consumer. Every dollar we spend is a vote. It's a piece of support. Let's make sure we're spending money in institutions that support our values. Visit Faith Driven Consumer to learn more. It's my firm view that we need to put pressure on these businesses to make decisions that reflect our values as Christians. We have a great deal of power, if we'd realize it. These businesses need to understand our resolve, and that we value our religious freedoms enough to fight tooth and nail for them. Conscientious objection and refusing to participate in LGBTQ ceremonies is not discrimination. Businesses must have the freedom to deny services in situations where their moral beliefs are severely entangled. Does that mean denying basic services like purchasing products or access to basic services? Of course not. But when accessing services requires participation in morally reprehensible activities then the religious business owner must be allowed at least some rights regarding participation. I recall a story that Dinesh D'Souza told about his movie 2016: Obama's America. Costco at first refused to carry the movie. D'Souza spoke out about it. But he didn't take any direct action. The word got out to the conservative community, and activists took action, calling Costco, tweeting to their accounts, emailing them, and protesting. D'Souza had hardly done a thing. But he got a call from Costco and he ended up walking into a room where he met the owner of Costco who looked D'Souza in the eyes and said,"Dinesh, you are destroying Costco!" That is the kind of power we have. We need to put pressure on these businesses. Then they will rethink their attacks on religious liberty. I promised to be brief, so I'll conclude by saying this: The time is now to take a stand for your Christian faith. It's time to take a stand for your Constitutional rights. It's time to stand for religious liberty and conscientious objection. It's time to get educated on these issues. It's time to raise our voice in our communities, to our representatives, and on social media. But it's important to remember: We're in it for the long haul. Don't expect short term results. Instead, dedicate your life to the service of these causes. Fight not over days or weeks, but over years and decades. We need to dig in, and fight for our values in the long term. The forces arrayed against us are massive and powerful, with deep pockets, so donate to Liberty Counsel, Alliance Defending Freedom and the Media Research Center. And become an activist with the Heritage Action Sentinel Program. It's time a stand for freedom, religious liberty, and the Constitution and Bill of Rights. Get educated on the Constitution, take a free course at Hillsdale College online. Let us assemble a coalition of businesses who will stand with us. Let us assemble a coalition of charities for religious liberty. And let us assemble a coalition of politicians and news media willing to stand for religious liberty. The enemy is arrayed against us, pushing their authoritarian agenda at all levels. We must stand like lions, charged with the fire of the Holy Spirit, in the authority of Jesus Christ, to stand against the night and make battle on the gates of hell. We must look upon the great struggles and act accordingly. But don't stare too unflinchingly. I often see the corruption, the horrors and evils of this dark struggle, and my heart laments bitterly. Such is an easy thing to do. There is much evil outside of us and even more, there is much evil within us. So we must mind our focus. We must focus our eyes upon Jesus Christ, the glorious perfecter of our faith. If I look upon the world I become afraid, if I look upon Jesus Christ I am at peace. What a struggle to keep that focus; but we must be careful to remain filled with the real hope found in Jesus Christ our savior. All is well with the Lord and one day soon that wellness will be the rule, not the exception. Until that day, God be with you.